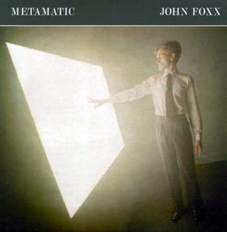 Burning cars, faces behind shattered windscreens, cinemas, a missing lieutenant, stepping into films and a blurred girl are just some of the images that John Foxx's visionary debut Metamatic throws at you. Foxx’s last album with Ultravox, Systems of Romance, was in many ways, already starting to sound like a John Foxx solo album. As the band reached its creative peak, Island Records dropped them, although Foxx had already announced his plans to leave. He retreated into his London studio to record his first solo album, Metamatic – an album that would prove to be a milestone in electronic music. Metamatic was recorded between 1979 and 1980 at Pathway, a small eight-track studio in Islington, with Gareth Jones, who would later work with the likes of Depeche Mode. Foxx's love or writing and art, particularly the futurism movement, all come together in his writing on this album. The title comes from “Metamatics” which were self-destroying machines, created by Swiss kinetic artist Jean Tinguely. Metamatic presents an isolated and haunting vision. Although not written as a science-fiction or futuristic concept album, it's modernistic feel never fails to propel the listener into a vast, futuristic metropolis of glass and concrete. From merging with crowds to dreams of leaving, the atmosphere of Metamatic is stark and cold; an often chilly listen, with its robotic rhythms, deep drones and screaming synths. Describing himself as “the Marcel Duchamp of electropop", Foxx's lyrics often echo the writing of JG Ballard, and his alienated vocals regularly send a shiver down the spine. It is an incredibly visual album, and Foxx has described the songs to be almost like a soundtracks to short films. "Plaza, "030" “A New Kind of Man”, "No-one Driving" and "Metal Beat" are some of the immediate standout tracks, alongside his debut solo single, "Underpass", which remains the most iconic John Foxx track. Anybody who has ever lived or worked in a city will instantly relate to many of the themes of Metamatic – towering glass and concrete, industry, roads, bridges, transport, crowds, grey suits and dreams of leaving. These themes would firmly embed themselves in Foxx’s future writing on albums such as Shifting City and The Pleasures of Electricity. 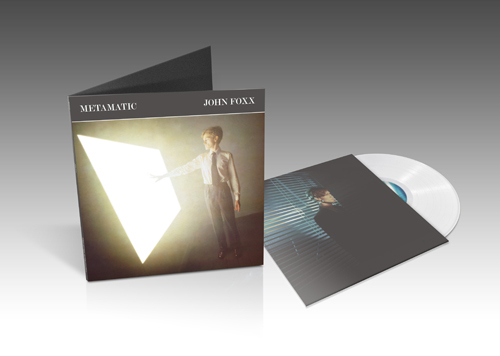 Metamatic was originally released in 1980, and gave Foxx his first taste of chart success. It was first released on CD in 1993, then remastered and reissued in 2001, with a host of extra key tracks, including the non-album single, “Miles Away”, as well as b-sides "This City", “Burning Car”, “20th Century” and several haunting instrumentals such as "Mr No" and "Film One". The album was once again remastered, repackaged and reissued as a definitive 2-disc set in 2007, this time comprising the original album on one CD and a second disc featuring the original b-sides, alternative versions and two newly recorded tracks; “To Be With You” and “Cinemascope”, which were pieced together from musical elements and lyrics dating back to the original Metamatic sessions. The haunting “Cinemascope” is arguably as strong as anything from the original album, focusing again on Foxx’s fascination with the silver screen. Metamatic has proved its staying power over the years, and with the return of analogue synths to contemporary electronic music, it sounds just as exciting as it did back in 1980 – and is certainly just as important. More information about the Metamatic single releases can be found here. Metamatic returned to the charts in April 2014 following an exclusive LP release for Record Store Day. Presented in a gatefold sleeve on white vinyl, this edition featured a new master of the album and was limited to just 1200 copies.